Roman Catholic Women Priests Respond to Pope Francis on Women's Empowerment, Call him "Pope of the Poor"
“Fort Myers resident Judy Beaumont, 75, ordained last year in Estero, is a pastor at Good Shepherd Ministries, along with Judy Lee, who was ordained in 2008 in Boston. The consequence is excommunication, but Beaumont said she would face it, and Thursday, she said she believes the pope is open to women being in authority and decision-making. There are roughly 160 ordained women priests around the world. A 2011 survey by the National Catholic Reporter showed 62 percent of Catholics indicated support for women in the role of priests, and 75 percent supported women as deacons. Pope Francis also told the magazine that the dogmatic and the moral teachings of the church, which has 1.2 billion members worldwide, were not all equivalent. Rather, he said, the Catholic Church must be like a “field hospital after battle,” healing the wounds of its faithful and going out to find those who have been hurt, excluded or have fallen away. “Pope Francis brings a tremendous freshness and joy with him that permeates through the writings that are inspiring Catholics around the world,” Atwell said. "This homily will be in plain talk and say difficult things to hear as that is the talk of Jesus in the Gospels, especially in Luke. This Sunday’s Scriptures are ultimately about God’s response to poverty, greed, and responsibility. They are also about forgiveness. That is good, for most commentaries agree that the intent of Jesus’ words in Luke 16:13 where it says that we “cannot worship both God and Money” was to make us squirm, if the shoe fits- and on some level it fits all of us. The “shoe” here has to do specifically with our obligations and responsibilities to those who suffer materially. The Hebrew Torah has over 630 ‘laws’ guiding our relationships with God and with one another. Many of these are specifically about our responsibilities to the poor. We may not be breaking the “ten commandments” but we may not even let the intent of the law into our consciousness. That is why Jesus boiled the commandments down to two: loving God first and loving our neighbors as ourselves. For Jesus that specifically includes our neighbors who live in poverty and relative poverty. Throughout the Scriptures, from the Law and prophets through the Gospels, God is concerned with our relationship with those who have little of this world’s goods, who are indeed our neighbors no matter where we may live. “Love your neighbor as yourself” (Leviticus 19:18) was quoted by Jesus when he spoke with the rich young man as recorded in the Synoptic Gospels in Matthew 19:18-21, Mark 10:17-27, and Luke 18:18-27. Jesus did indeed feel deeply for the poor, saying (Luke 6: 20) “blessed are you who are poor, for yours is the kingdom of God.” Jesus lived without possessions or even his own home. Most of his followers were the poor of Galilee. Many of our homeless people identify with not having a place to lay your head. When Jesus blessed the poor in Luke, it is the blessing of economically poor folks, not humble folks although they may be humble too, materially poor, not the “poor in spirit” as recorded in Matthew 5:3. Luke consistently shows Jesus as concerned for the poor and upset with the rich (see for example the parable of “the rich fool” who hoarded his valuable crops when he could have fed the community Luke 12:13-21). Luke also shows that no matter how hard it is for the rich (those who have a good deal of the world’s goods) to be part of the kingdom of God “nothing is impossible with God” (Luke 18:27). In today’s gospel, and throughout Luke, Jesus comments strongly on those who focus on accumulating money and goods and have money as a “superior”, a boss, a god, a reason for being, thereby rupturing the covenant relationship we have with God who asks that we put God and what God wants first: to love and treat our neighbors, especially those who have little, as ourselves. The other strong theme in the Gospel of Luke is forgiveness and that is in today’s Gospel as well. The manager who mismanaged the landowner’s resources also lightened the debts of his debtors. For the wrong reasons, to save himself, he forgave debts and the landowner then forgave his debts. God forgives our mismanagement of resources, the very resources that could help others (and our planet) live, if we make any attempt at all. We can go so far as to say, God forgives even when we make no attempts at reparation, for that is God’s nature –to forgive. But if we say we love God and our neighbors would we not even try to show our love to the poor and God’s creation in actual material ways as well as in spiritual support? Sunday’s Scriptures include good news for the poor and that is something poor folks desperately need. The readings in Amos, Psalm 113, and the Gospel clearly say that God is on the side of the poor, and God is not tolerant of greed and exploitation. How good it is to feel that God is on your side when everything else seems to be against you. We are blessed to be church with the poor so I will share some stories that may illuminate this homily. Barry, 60, is a formerly homeless man with back injury who is now a beloved Elder in our church. Walking with us he was able to reconcile with his family and obtain subsidized housing and his disability income. He is now a role model for our young people, a God-parent to some of the newly baptized, a prayer leader and a friend and brother to all. When he is out ill, there is an emptiness that is palpable on Sunday. 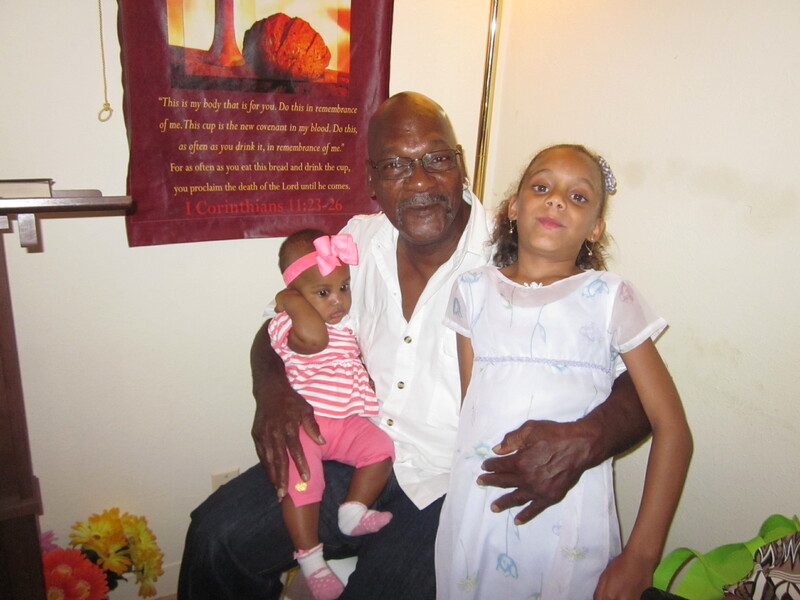 Barry needed a spinal treatment that was not covered by Medicaid and would cost about $4000. He was in tremendous pain. Church members who had adequate and better incomes and others made a good down payment on this treatment, the rest was put on our credit card. He agreed to pay half of it back to the church. He has been doing so, but it is difficult on his fixed income. Recently we received some donations and were able to forgive his debt completely. His health needs were met and his burden lifted because the people of God took up their responsibility toward the poorest. He could not believe it or accept it easily. He will be giving donations to the church as he can, but is relieved that the debt is gone. He asked: “that is what Jesus does with us, isn’t it?” And it is, even in today’s Gospel. Yesterday co-pastor Judy Beaumont brought Sharon to sign the lease for her first affordable HUD subsidized apartment. These are all too rare here but she was finally able to get one. We helped her initiate this process over four years ago. We rejoiced as we saw her joy at seeing her own home and at finally being able to live on her own. She has profound deafness, few work skills, and was dependent on an abusive and possessive older male partner. 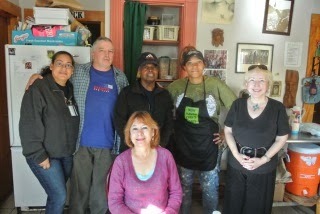 With this new start, and her first home at almost fifty, she got a new lease on life. It was a miracle that she lived to see this day. There was no way she could have moved on without the support of rental assistance and pastoral and communal support. She thanked us for not giving up on her. We thanked God together for but for the grace of God we may have done so. A woman named Kelly Sue spoke with me at the suggestion of a church member. She is a poor woman, older, living solely on a small Disability check and suffering with a broken spine and the pain of a difficult hip replacement. Her son lived with her and was a help in all ways until he became addicted to drugs. In the course of a few months he stopped working, stole her money and left. She was not able to pay the high rent without him was evicted. She cried as she told the story of her eviction: her things were thrown out into the street and the landlord appeared and cursed at her for not paying the rent. She was both homeless and humiliated. A dear friend brought her here so she could start again. As we talked and I gave her my understanding, encouragement and hope of affordable housing she blessed me for being God’s instrument of hope. She said that now she knew God was on her side. I could not have agreed more. The image of her landlord humiliating her reminded me of Sunday’s Scriptures. The prophet Amos warns the Covenant people that God is tired of their greedy behavior, especially the exploitation and neglect of the poor (Amos 8:4-7). The people are complacent participants in systems that “trample on the heads of the poor…and deny justice to the oppressed” (2:7) and “live off the needy and oppress the poor people of the land” (8:4). Amos says that God “hates” the religious assemblies and hymn singing of the hypocritical who do not keep the law of justice and gratify themselves at the expense of others. Amos says “Let justice run down like waters and righteousness like a mighty stream” (Amos 5:23-24). For Amos justice is not an abstract concept, it is justice for the poor and marginalized. Sharing, giving, mentoring, feeding, clothing, housing and loving the poor- and challenging those systems that keep people poor and fail to meet even basic needs. Without subsidized housing neither of these women can afford to have a home, a place to live of their own. Making this available is the worship that God loves and desires. Superficially religious greedy folks have ruptured the Covenant relationship with God as God abhors injustice and asks in the Law that people “love their neighbors as themselves” (Lev. 19:18) emphasized by Jesus as part of the Greatest Commandment (Matt. 19:19). Later in the verses just after the Lukan Gospel of the day, in Luke 16:17-18, Jesus says to the “money-loving” Pharisees who are sneering at him and didn’t get his story about the dishonest steward that the Law with its obligations to the poor still holds: “not one stroke of the pen in the Law will pass away”. They are held to God’s standard of justice. God does not like ugly-especially directed against God’s most vulnerable people. God does not like sweatshops in Bangladesh that burn and topple down as hundreds work at machines where brand names are turned out cheaply for our consumption. Why do we buy those products? God, who has no Party affiliation, does not like the ugliness of Congress that blocks legislation that could allow someone with no insurance to get medical treatment. This year in Florida the State Legislature turned away billions of free dollars for health care for poor people who only have the ER as their medical care, just to defeat “Obamacare”. Even some of my own medical providers are frightening me with what I will lose under Obamacare. I know enough to know that they are wrong. I can still get my CT scan if needed. But they stand to profit if things remain as they are and may or may not take in less profits if the poor are also included in health care. It is about the profit margin of rich providers. Here is a point of information for those who think all poor folks are covered by Medicaid as I so often hear: it is not so. The working poor are not covered and there are many, and we serve them, who live way under Medicaid standards and are still not eligible for it. Our church member Milly works cleaning toilets at a large store and also cleans offices by night. She is working and poor and she has, and can presently afford, no medical coverage. She needs every penny for rent and food for her family. She goes to work with excruciating migraine headaches and back aches, but she has no medical assistance. She simply cannot afford it. That is sin. In Florida the numbers of uncovered individuals are staggering. Yet, the Federally offered money for the poor was turned down. That, in my estimation, is mismanagement of God’s affairs, that all the sick can be treated (ER’s are expensive to users and tax-payers and and do not offer follow-up), and that is, therefore, sin. Similarly, all of the subsidized housing lists here and in many places are frozen. This is a denial of people’s rights and needs to have a place to live. They live tripled up and in cars and on the streets. That too is mismanagement of God’s affairs. We have maintained about three thousand people who are homeless in the greater Fort Myers area for several years now. So, it is not only our personal response to our neighbors that matters, and it does matter, but our response to systemic evil and inadequacy. The poor are beloved of God .Those who exploit or neglect the poor are chastised by God. From what I have seen, I wish it would do some good. But Jesus offers love to all, love and forgiveness. In today’s Gospel even though the “mis-manager” lightened the debts of others for selfish reasons, he was forgiven and challenged to manage better. And we are challenged to love God and not our material things-to manage better. The generosity of Jesus in including ALL in God’s grace was often a problem for the religious who sneered at him and ridiculed him. They didn’t get it, God loves and forgives ALL. Let us do the same." Rev. Dr. Judith Lee, ARCWP—Co-Pastor of the Good Shepherd Community, Fort Myers, Fl. Dotty Shugrue, Janice Sevre-Duszynska, and Bridget Mary Meehan from the Association of Roman Catholic Women Priests visited the Amistad Catholic Worker House in New Haven, Connecticut on Sept. 20, 2013.
always someone there to say: "Come in, you are home. We can help you." Mark and Lucy Colville along with son Isaac, Herb, a long-standing member of the community, who is the chef and Sarah, the most recent member, and a graduate of Divinity School work together in a variety of ministries to serve the community including food, shelter, pastoral care, and conversation. Mark does non-violent resistance against war and U.S. military intervention. Janice and Mark have done actions together to shut down Guantanamo. Mark expressed interest in Dotty joining the open and inclusive celebration of the Eucharist in down town New Haven, called "Chapel on the Green." Dotty expressed joy in anticipation of working with this grassroots community, " I am looking forward to meeting the rest of the community to determine how we might work together in celebrating our spiritual lives and commitment to this prophetic justice ministry. " As Pope Francis states in his interview, " A Big Heart Open to God,"
"being prophets may sometimes imply making waves." 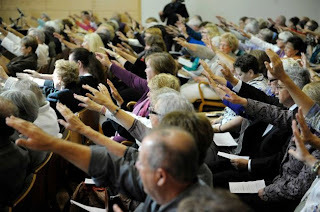 Not only are there more than 160 ordained women contemporary prophets in the Roman Catholic Church serving inclusive communities in Europe, Latin America, Canada and the United States, but in more and more places, the people of God are affirming the full equality of women as the voice of God in our times. In response to the Pope's concern with "female machismo," our brothers at the Vatican must embrace gender justice, including women priests. Women's human rights, including spiritual authority, is the elephant in the living room of the Roman Catholic Church! It is our pastoral responsibility to make the connections between oppression of women within the church and violence toward women and their children in the world. 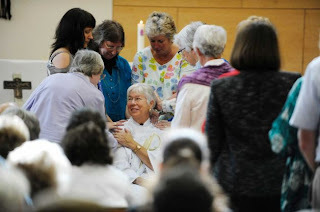 The international Roman Catholic Women Priests Movement is a prophetic new path where all are welcome to receive sacraments and which mirrors Gospel equality and the inclusiveness that Pope Francis is calling the church to live. 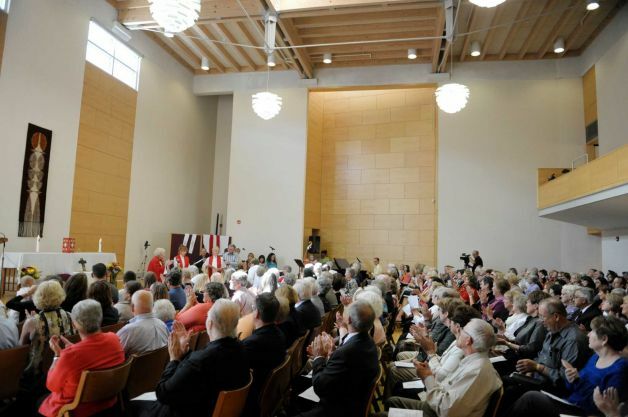 ALBANY -- When Pope Francis told a Jesuit magazine that the Roman Catholic Church should be a "home for all" and "cannot insist only on issues related to abortion, gay marriage, and the use of contraceptive methods," his comments resonated with local parishioners. Several Catholics, speaking before Sunday evening Mass at the Cathedral of the Immaculate Conception in Downtown Albany, told NewsChannel 13 the pope's message was on the mark. "I think that makes a lot of sense," the Rev. Paul Smith, who celebrated the 5 p.m. Mass, said outside the cathedral. "I notice that he didn't say that those issues were unimportant and that they deserve no focus -- he didn't say that -- but he wanted to balance it." In a lengthy interview published Thursday, Francis told the magazine America, "We have to find a new balance, otherwise even the moral edifice of the church is likely to fall like a house of cards." "I think he was right," parishioner Andrew Lauria said. "The church's fundamental goal is for the salvation of souls, and so we have to do that in a particular manner, and that starts first by taking care of people." A day after the pope's comments were published, Francis denounced abortion and the “throw-away culture” that justifies it. Francis, who made headlines in July by saying "Who am I to judge?" when asked about a gay priest, spoke broadly about homosexuality in the magazine interview. "When God looks at a gay person, does he endorse the existence of this person with love or reject and condemn this person?" he asked. "We must always consider the person." Mary Martin, an Albany parishioner who noted that Francis "seems like a grandpa" to her, said she agrees with his assertion that such controversial issues should not dominate the conversation. Martin continued, “That's their business, but I don't think we should have it spread all over the newspapers for children to read and wonder what that is and try it." Though Francis said he does not support the ordination of women priests, he told the magazine, "Women are asking deep questions that must be addressed. We must therefore investigate further the role of women in the church." Smith, in Albany, said he welcomed the possibility. "I hope that he would do some reversal as far as just giving consideration and taking a long look at women as priests, which is only one part of that issue," Smith said. The Association of Roman Catholic Women Priests recently ordained an Albany woman, Mary Theresa Streck, but the Catholic Church does not recognize her as a priest. Bishop Howard Hubbard was not available to comment Sunday on the pope's recent remarks. women in the church. We have to work harder to develop a profound theology of the woman. Today, we (Bridget Mary, Dotty Shugrue and I) visited Dotty’s monastic nun-friends at Our Lady of Mt. Caritas Monastery in Connecticut. Dotty has been their friend for years. She has also served as their priest, presiding at liturgies for them. The names of these women are Mother Mary Peter, 82, and Sister Francesca, 76. They practice the rule of St. Benedict and live on 36 acres of partially wooded land filled with herds of deer and wild turkeys. They also have a donkey named Placida who brayed for us in song after we petted her. Later, she enjoyed a quartered apple that we fed her. Their house is also filled with dogs of various sizes. Dotty met the sisters when she was informed of some difficulties they were having with the diocese. Dotty went there, introduced herself, and they became friends. They had been denied the Eucharist in their chapel by the Roman Catholic diocese, so Dotty, a Roman Catholic Woman Priest, began to minister to them as their priest. The sisters have been there for 36 years. They were recognized by the bishop of the diocese who received their public vows shortly after their arrival. Over the years, the bishops that followed weren’t eager to support the ministry of the monastery and the sisters, even though there was no cost involved. At our visit today, Dotty brought along a delicious lunch which we prepared. Bridget Mary and I could see how endeared Dotty was to the two sisters. After tea we began a tour of the monastic grounds. We visited the retreat center with four bedrooms. Then on to the chapel – which is a work in progress – and then to the sister’s home in which there is a cozy sacred chapel for individuals or small groups. Each of the buildings was filled with statues of Jesus, Mary, angels, St. Francis with animals as well of Sts. Benedict and Scholastica. Moreover, we noticed the various pictures of Jesus and Mary, all memories from our young Catholic school years. Our Lady of Mt. Caritas Monastery is surrounded by primitive woodlands where one can find solitude. Here, one can also celebrate the beauty of Creation and God’s creatures as well as the spirituality of God’s presence. It is a holy ground where the sisters nourish the land, each other and Creation. 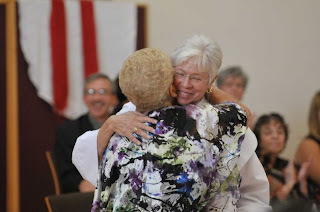 The echo of laughter reverberates throughout as these strong women find strength in each other, their neighbors and friends as well as their prayerful life in the midst of seclusion and beauty. Come here to relax, refresh and renew your soul amid the beauty of Creation. Our impassioned ARCWP group in Colombia, South America consists of two ordained priests, three strong candidates, and several applicants and supporters. On September 14 and 15,2013 the group met in Envigado, Antioqua under the guidance of Rev. Olga Lucia Alvarez Benjumea who was ordained a priest in December of 2010 in Sarasota Florida. Aida Soto Bernal, the other priest ordained in Colombia in March of 2011 was not able to attend this meeting. The group will meet on a regular basis to reflect on their service to the people of God and their growth and commitments as women priests,aspirants and supporters. Rev. Dr. Judy Lee who is a co-guide of the candidates with Rev. Olga Lucia Alvarez Benjumea was able to greet the group on Saturday night by SKYPE. She also sent responses to questions and comments sent by those assembled. Rev. Judith Beaumont greeted them as well. An RCWP candidate in Spain also communicated with the group. Candidate Marina Teresa Sanchez of Santiago de Cali was the scribe for the event, keeping good records of what was said and planned. A leader in her faith community in Cali shared the mission of the community of faith in Playa Reciente, Cali and how happy they were to support Marina Teresa. Candidate Judith Bautista Fajardo of SantaFe de Bogota began the two day meeting with liturgical dance from the Native American (Navajo) culture. She also shared a poem entitled Confession about finding her calling. A religious sister and missionary who was a supporter was present and shared her ministry and prayed with the group. Each one present reflected on her own journey of love and service. The time together ended with a beautiful and simple Eucharistic Liturgy led by Rev. Olga Lucia and celebrated communally by all present. What joy it is to have a strong branch of the Association of Roman Catholic Women Priests growing in South America. We have much to learn from them. Thanks be to God! into an authentic human fellowship. It is risky to celebrate the Eucharist. first to give back to the poor what belongs to them. Albany Times Union: "Group installs female priest:Grass-roots organization ordains nun, but Catholic Church won't recognize her"
"There was no air of controversy inside the First Unitarian Universalist Society on Washington Avenue Sunday afternoon — only jubilation. Despite the Catholic Church's stance on female priests, the Association of Roman Catholic Women Priests says the Sunday ordination of Mary Teresa Streck was legitimate and that the longtime nun is now one of about 160 female Roman Catholic priests in the country. None of them are recognized by the Vatican. "It is with great joy I present to you our newly ordained priest," Bishop Bridget Mary Meehan told the excited crowd after Streck's ceremony was completed. "This is a very joyful day," Streck said after the ceremony. "Nothing but joy." Meehan and others in her grassroots group say there is no theological basis for barring women from the priesthood, adding that women were ordained in the church's earliest years. In July, Pope Francis told USA Today that "the church has spoken and says no ... that door is closed," when asked about female priests. Churches have disciplined and even expelled priests who have so much as attended ordinations recognizing women as priests. Meehan said that the Albany diocese sent out a memo telling its leaders not to attend Sunday's service under threat of reprimand, though the diocese could not be reached Sunday to confirm or deny Meehan's claim. "I do not consider myself excommunicated," Streck said. "I hope other women consider this path." While speaking to crowd at length, Meehan, who lives in Florida, often likened the women priest movement to civil rights activism, invoking Rosa Parks on several occasions and saying the ancient guidelines the church says forbids women priests are outdated. "Rules of those times had nothing to do with love and compassion," Meehan said. "The Catholic Church needs to wake up." ALBANY — "Mary Theresa Streck didn’t have to say much to raise thundering applause from the crowded First Unitarian Universalist Society of Albany hall Sunday afternoon. Her voice was almost apologetic, like she knew what was coming. A wave of cheers filled the hall. Streck, an Albany native, was ordained a priest by the group on Sunday, joining roughly 40 other women priests in the association. The Roman Catholic church doesn’t actually accept women priests. That’s why the ARCWP, which is not under the direct authority of the pope, conducted its ceremony in the Unitarian hall. Ever since the ARCWP began with seven women back in 2002, Meehan said there’s been some major pushback from Vatican leadership. But a few minutes before her ordination, Streck herself didn’t seem all that concerned with the opinion of people at the Vatican, or her own status as a church Rosa Parks. Streck’s relationship to the Roman Catholic church was always unique. She joined the Sisters of Saint Joseph at 17 and stayed in the fold for 18 years. Then in 1984 she fell in love with Jay Murnane, a priest. Decades after leaving the order to marry Murnane, Streck said she’s still close with the sisters. Together, Streck and Murnane built the Ark Community Charter School in Troy and continued their ministry. These days she runs the Ark alone, Murnane having passed away. And she attends an open Catholic service every month at the Unitarian church, which caused her to pursue the priesthood. “I hope one day women priests will be accepted by the full church hierarchy,” she said. Until then, she seemed happy to be ordained at all. Two other women, Maureen McGill, of St. Petersburg, Fla., and Mary Sue Barnett, of Louisville, Ky., also were ordained as deacons. It was a very open sort of ceremony. The hymn, “All are Welcome” was sung. A woman danced down the aisle at one point with a bucket of incense, streaking the air with bright white smoke. The congregation was asked to pray over the newly ordained, a job usually saved for other priests. Richard Roy and Stephen Peterson, both priests in the National Catholic Church of America and a married couple, sat near the front, casting approving eyes over the proceedings. There weren’t many young people. The crowd largely belonged to a generation convention says would oppose women priests. "The Association of Roman Catholic Women Priests celebrated the ordination of a woman this afternoon in Albany. She's one of about 160 women who call themselves Roman Catholic Priests in the world, but the Catholic Church calls them excommunicated. 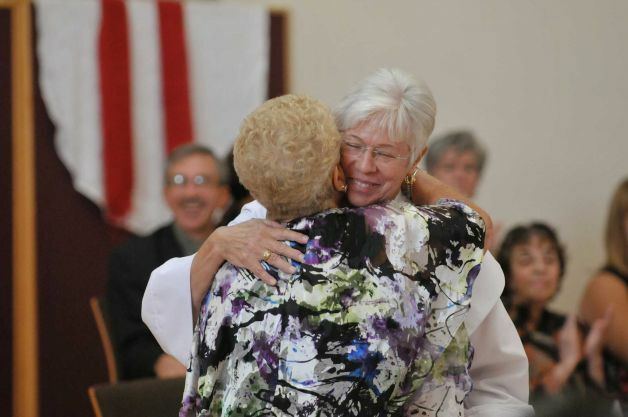 In a ceremony filled with emotion and applause, Mary Theresa Streck was ordained a priest. “I'm feeling very joyful. I am very excited about this pathway that I've chosen,” said Streck. Her path started in a Roman Catholic Church in Loudonville. She joined a convent and that's where she says she learned to live the gospel and how to live it equally with men and women. “Unfortunately the Roman Catholic Church discriminates against women and Canon law says only a baptized male can be ordained,” she explains. A spokesman for the Albany Roman Catholic Diocese says "a woman who claims to be an ordained Roman Catholic Priest has separated herself from full communion." The Association of Roman Catholic Women Priests says just because its ordinations of women as priests are illegal under the church's Canon Law, doesn't mean they're not valid. Bishop Bridget Mary Meehan says the argument that Jesus only chose men as his disciples is also not accurate. “The church should follow the example of Jesus who had male and female disciples,” she says. Meehan and Streck say this movement is really about transforming the church into a community of equals." ALBANY -- A historic day for women in the city of Albany. The Association of Roman Catholic Women Priests ordained the first female priest in Albany. Mary Theresa Streck says the journey has been long...but worth it. "I'm hoping that I'm breaking the stain glass ceiling absolutely," she tells us. "We are seasoned daughters of the church, we love the church, we don't believe we are leaving the church instead we are leading the church," Janice Sevre-Duszynska, a priest with the ARCWP tells us. But it hasn't come without controversy. We're told some members opted out of sundays ceremony because they were threatened of being kicked out. "I certainly would not want anyone to put themselves in any position of harm because they are my brothers and sisters, but it saddens me that they would be pressured not to come to this joyous celebration," Streck says. 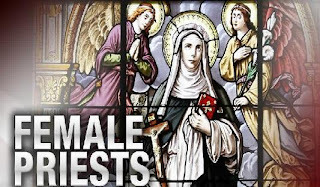 "According to a recent CBS gallup poll, 70% of Americans support women priests in the catholic church, this year alone, the association of roman catholic women priests ordained 15 deacons and priests. "it's sexism and it's injustice, and sexism like racism is a sin. so we just like in the civil rights movement and in other movements we are breaking an unjust law. our ordinations are valid and so we believe we are moving the church forward," Sevre-Duszynska says. "Like Rosa Parks who refused to accept second-class citizenship and refused to give up her seat on the bus, we are no longer going to tolerate second class citizenship in the Roman Catholic church we are leading the church we are leading the church not leaving the church into it's future," bishop of the ARCWP, Bridget Mary Meehan says. The movement of the ARCWP has been growing since it's start in 2002, with the ordination of seven women. Today there are more than 150 women in the world in the Roman Catholic Women Priests movement, including 100 in 30 states in the U.S., and now they can add one more here in the Capital Region." A woman from the Capital Region is now a self-proclaimed Roman Catholic Priest. Mary Theresa Streck was ordinated on Sunday. YNN's Maria Valvanis reports. ALBANY, N.Y. -- "It's a very joyful day for me," said Mary Theresa Streck. 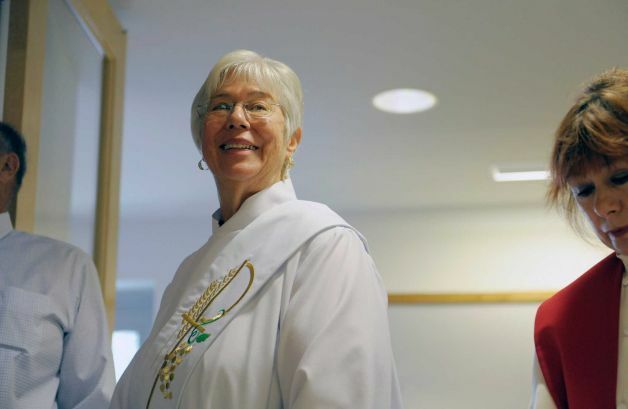 Hundreds of people filled the First Unitarian Universalist Society of Albany to watch as Mary Theresa Streck became the first Capital Region Roman-Catholic woman to be ordained. Streck said, "It's a pathway that I've been on for a very long time and I'm so excited to be now an ordained woman priest." "When I was growing up in the fifties girls couldn't even be alter girls, much less become a priest," said Linda Burtis, a Delmar resident. Burtis said she wasn't sure if she would ever see a Roman-Catholic woman ordained in her lifetime. "Today was history, today was seeing the Catholic Church the way I've wanted to see it since I was a child," she said. However, the Catholic Church doesn't neccessarily agree. Vatican law forbids woman priests, and threatens anyone who disobeys that law with excommunication. "It is not a penalty that we fear because the prophets and saints have always had to cross the line of hierarchy or disaproval so we too feel that we must be prophetic woman of the gospel of Jesus Christ and live as decipels and equals," said Bishop Mary Meehan. Bishop Mary Meehan, who presided over the ordination, said more than 160 woman world-wide call themselves Roman-Catholic Priests. As the movement grows larger, they are calling on Pope Francis to make an official change. "Our message to him is you need to embrace woman as your sisters and equals and honor their gifts as priests, it is time," said Meehan. Streck added, "I don't consider myself excommunicated, because this is my church. The large crowd that was here, the people of God affirm my role as priest within this community." Streck's first meeting will be held at 3:00 p.m. on October 20 at the Unitarian Society. She said everyone is welcome to attend. " ALBANY, N.Y. – Three woman will be standing up to the current rules of the Roman Catholic Church by being ordained on Sunday. At 2:30p.m. at the First Unitarian Universalist Society on Washing Avenue, Mary Theresa Streck will be ordained as a priest. She will be the first woman priest in the State of New York, as part of the group, Association of Roman Catholic Women Priests. Two other women, Mary Sue Barnett of Lousiville, KY and Maureen McGill of St. Petersburg FL will be ordained deacons. The Association of Roman Catholic Women Priests hopes Pope Francis I, who has been in his position as Bishop of Rome for six months, will embrace gender equality regarding church roles. Streck is a former Sister of St. Joseph and earned her Ed.D. in Educational Leadership. She is a co-founder and director of Ark Community Charter School in Troy, a school which aims to serve low-income families. Barnett is a wife and mother who earned her Master's Degree in Religious Studies and Biblical Studies. In Louisville she is a mentor for a young adult feminist group. McGill is a wife, mother and grandmother who retired from her position as an attorney in Florida. The movement of women priests has been an ongoing movement for eleven years, when seven women were ordained. According to the women heading the association, there are more than 150 female priests worldwide. On Sept. 15th, 2013 Bishop Bridget Mary Meehan ordained Mary Theresa Streck a priest and ordained Mary Sue Barnett and Maureen McGill deacons. This historic ordination took place at First Unitarian Universalist Society of Albany, New York. 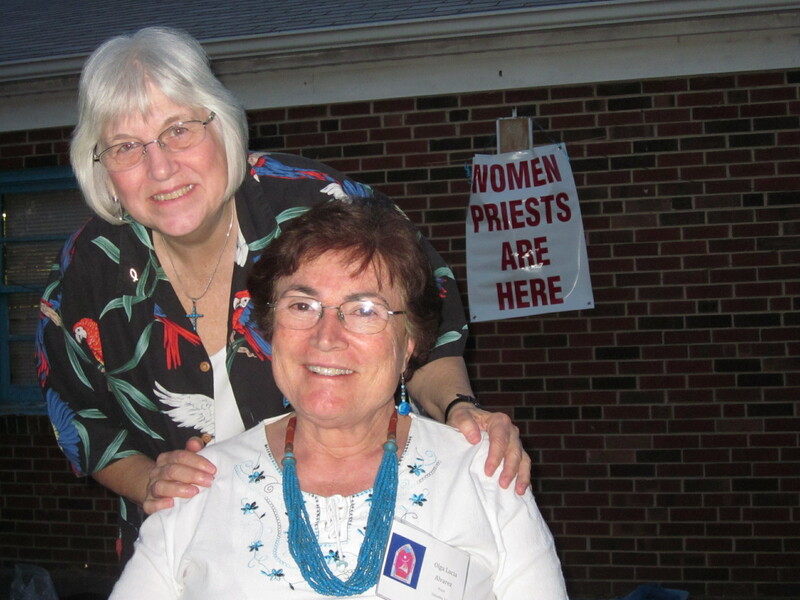 Approximately 350 enthusiastic Catholics attended this historic ordination by the Association of Roman Catholic Women Priests. Bridget Mary presents Mary Theresa as a newly ordained priest.